Nikon have several segments in their range of cameras, the P in the title P330 stands for ‘Performance’, a name that seems justified here. With a 12.2MPix sensor the image files are not huge but should suffice for all normal uses. The lens is a 5X optical zoom: 5.1mm – 25.5mm f1.8 – 5.6. The 35mm full frame equivalent would be 24mm – 120mm. Optically the design is 7 elements in 6 groups. There is a wide range of functionality: vibration reduction, built in GPS, HDR capture, high speed shooting (up to 120fps for 60 frames where conditions allow! Normal high speed continuous shooting is still 10fps) and full HD Video with up to 60fps. The camera is 103mm x 58.3mm x 32mm and weighs 200g, this is in about average for the type. The screen is 7.5cm and has 921k dots, enough to give good feedback to the user. 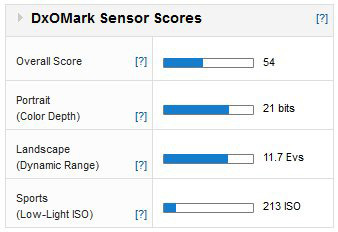 With an overall DxOMark score of 54 the Coolpix P330 is the best ‘compact’ camera that DxOMark has tested. However if you broaden the category to include ‘High End Compact cameras too it still holds its own, ranking in the top 10. Given the price this is quite an achievement. The individual scores are consistently good, 11.7 EVs for dynamic range and 21 bits of colour depth are scores more likely to be seen in a DSLR, only the Low-light score of 213 ISO reminds us that this is a camera with a sensor just 5.6mm x 7.4mm. To criticize the P330 for its low light performance would be unfair, since it is the best performing with this size of sensor. Here are three compact cameras that have very similar specifications: similar zoom ranges, video features, resolution etc. The Fujifilm XF1 looks very pretty but in all other respects the Nikon P330 has the edge over these very capable competitors. 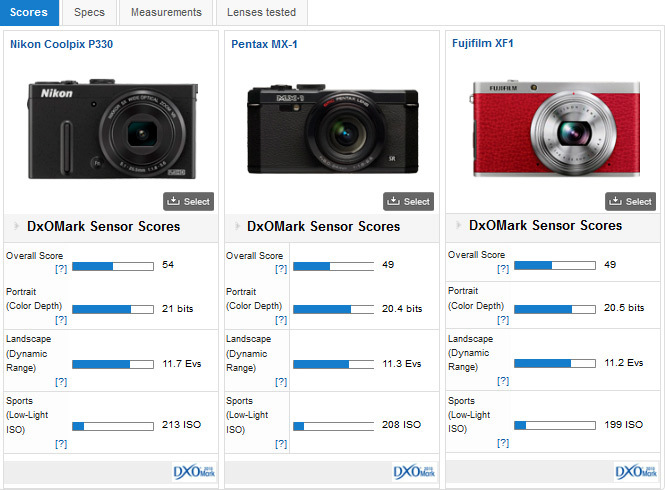 None of the differences is huge but combined the Nikon has an overall score 5 points higher. It is also priced competitively against the others and is the only one with built in GPS. 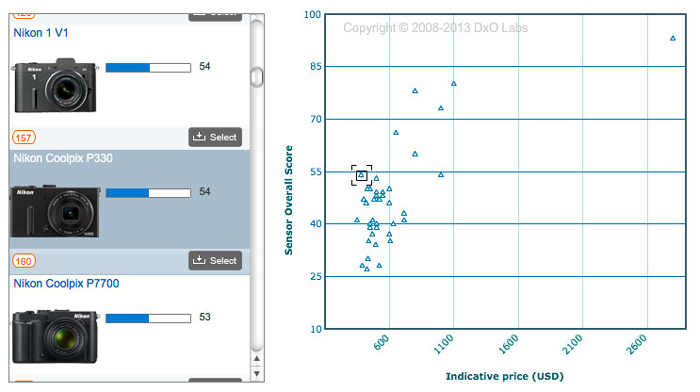 As the cheapest of the three the P330 shouldn’t compete quite this well! 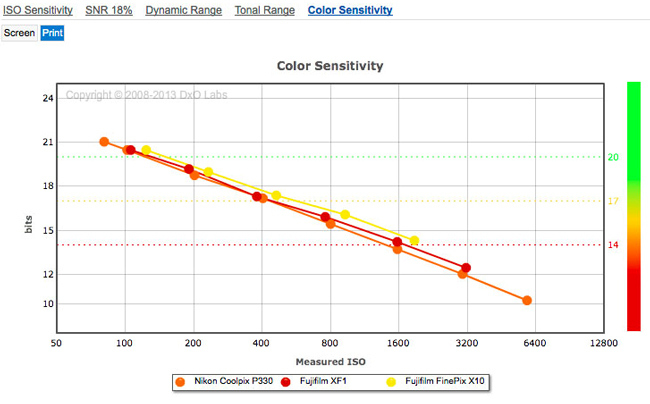 The Coolpix P330 is a better performing camera than the P7700, and better than the Nikon 1 V2. And yet it is the cheapest. 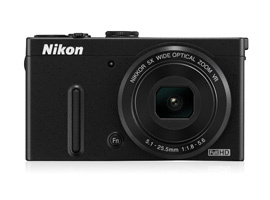 If you are looking for a good compact camera for everyday use then, unless you have a specific need for interchangeable lenses or are desperate for a longer zoom range, the Nikon Coolpix P330 is a really excellent way to spend your money.